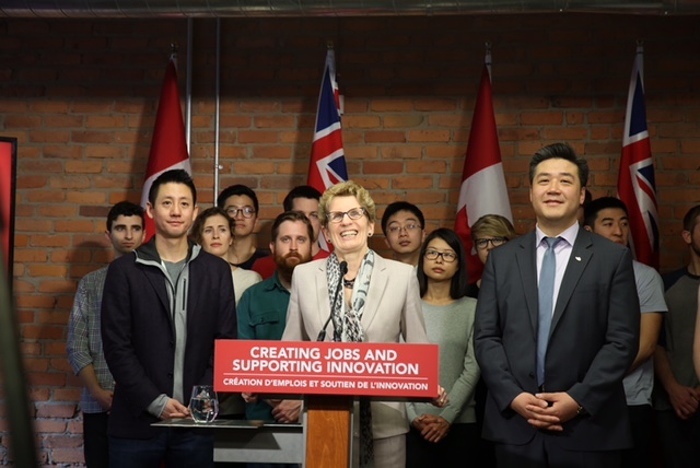 March 21, 2016 9:20 A.M.
Premier Kathleen Wynne's trade mission to China last November is continuing to help create high-value jobs in Ontario at companies such as technology startup 500px. The Premier highlighted this success today during a visit to the Toronto headquarters of 500px, a global online photography community for sharing, discovering and licensing photos. 500px has already hired 14 new employees in Ontario as a result of a venture capital agreement it announced during the China mission, and it plans to hire about 10 more people by the end of this year. The agreement with the Visual China Group -- part of a Series B financing round worth $14 million -- will allow 500px to expand its global operations and its headquarters in Ontario. This agreement illustrates how Ontario's Going Global Strategy is helping startups across the province tap into global markets. International trade missions are a critical way for the government to attract new investment, foster innovation and increase global exports. Attracting new investments and helping the province's businesses compete globally are part of the government's economic plan to build Ontario up and deliver on its number-one priority to grow the economy and create jobs. The four-part plan includes investing in talent and skills, including helping more people get and create the jobs of the future by expanding access to high-quality college and university education. The plan is making the largest investment in public infrastructure in Ontario's history and investing in a low-carbon economy driven by innovative, high-growth, export-oriented businesses. The plan is also helping working Ontarians achieve a more secure retirement. 500px was founded in Toronto in 2009. It joined Ryerson University’s DMZ incubator in 2011. Images on 500px represent the work of over 7 million professional and hobbyist photographers. Through its marketplace, 500px works with thousands of agency and brand creatives, who use its images in marketing campaigns around the world. Premier Wynne led trade missions to China in 2014 and 2015. These missions generated agreements that are worth an estimated $3.8 billion in total and are expected to create 3,500 jobs in Ontario. This document was published on March 21, 2016 and is provided for archival and research purposes.